Unjo creates the optimal solution for each individual customer, delivering state-of-the-art control performance. Where there is a motor or a group of motors, there is also need for controlling motor performance. The demand for precise control is constantly increasing for reasons such as speed, accuracy, energy efficiency, quality, noise reduction and ever increasing competition. Just as important is to find a solution that is cost efficient and fits your space requirements. Understanding your application in combination with our experience of external requirements such as regulatory demands puts us in strong position to solve your challenges. Optimized performance: By doing a full customization you get the most out of your unique motor application. Life-time support: We take full responsibility and regularly upgrade your product during its entire life cycle. 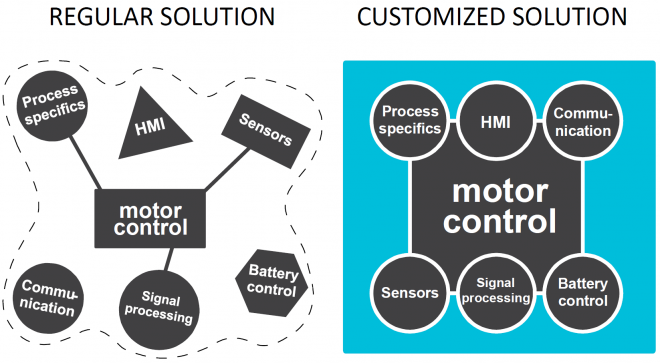 Application enhancements: With our large application experience, improvements and new features can always be integrated to your customized motor controls. Short time-to-market: Based on existing platforms and Unjo Core™ we customize your application to quickly launch your product. System effectiveness: Designing a well-tuned controls together with the right type of motor can drastically increase the effectiveness of the complete system. Energy efficiency: By selecting the right motor and optimizing its controls, we turn the energy into motion rather than heat. Guaranteed functionality: We always deliver the agreed functionality over time, that we have defined together in the project specifications.